The sixth video in the series “Peak Oil and a Changing Climate” from The Nation and On The Earth Productions. 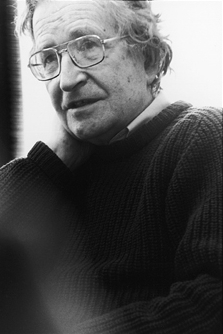 Linguist, philosopher and political activist Noam Chomsky talks about the Chamber of Commerce, the American Petroleum Institute and other business lobbies enthusiastically carrying out campaigns “to try and convince the population that global warming is a liberal hoax. Fast Food Advertising is On the Rise — With a Focus on Minority Youth — While Kids Continue to Grow Fatter. What’s Wrong With This Picture? : TreeHugger. I was watching the Super Bowl last night (I was actually studying but at the bar with my friend). Anyways, a commercial came on for McDonald’s and there was a bear daddy and a bear kid. The bear kid got all A’s on their report card!!!!! His reward? A fattening, unhealthy, calories-that-make-your-mouth-drop, greasy disgusting meal from McDonald’s. It is food made without love and purely to have the cheapest ingredients necessary in order to make a profit. How are parents so unaware of the lessons that we are teaching our kids? I wish someone would have taken the time to make sure I learned good nutrition while I was young. My dad did pretty good for being a single dad but there were definitely many nights where we would just grab something to eat. We ate a lot of spaghetti until he expanded his menu to include sausage with peppers and onions (greasy) and sometimes pot roast, and once in awhile in the beginning – chicken cooked in the microwave…YES CHICKEN COOKED IN THE MICROWAVE!! IIIIICCCCKKKKKK!!!!! It also happened at school where we were offered choices between this greasy distungness or that greasy disgustingness. You would think that at school your kids are getting nutritious meals. This is not the case. At my high school you could get all the greasy crap and extras at a snack bar in the cafeteria. You could totally bypass whatever was being served that day and get fries and 2 half-moon cookies with chocolate milk and soda!! All’s I am saying is…for the love of God…take the time to love your child enough to start them out with healthy eating habits. I have been obese since puberty and suffered ridicule for this my whole life until recently. Parents nowadays don’t want to take the time to finish and win an argument. They think their children have some sort of democratic say in their own lives. Basically, you are reasoning with someone who has no life experience and they give in because it is easier than the fight to change it. Pssst lazy parenting, I think. Oklahoma bill would mandate educators question evolution in classes | Raw Story. Educators in Oklahoma would be forced to openly question in their classes the legitimacy of the scientific theory of evolution should a new bill become state law. “It’s a simple fact that the presentation of some issues in science classes can lead to controversy, which can discourage teachers from engaging students in an open discussion of the issues,” state Rep. Sally Kern, a Republican, said in defense of the bill she filed recently. The legislation (HB 1551) titled the “Scientific Education and Academic Freedom Act” singled out “biological evolution, the chemical origins of life, global warming, and human cloning” as topics that are controversial and thus questionable.